Velan Andus, an Imperial commoner, is the keeper of the Waterfront Lighthouse, located on a peninsula in Lake Rumare in the Waterfront District of the Imperial City. He sleeps in the lighthouse from 6am to midday. On weekdays, Velan takes a trip to The Bloated Float Inn for lunch, which he eats from midday to 2pm. During the weekend, he eats lunch alone at home during the same hours. Between 2pm and 6pm he walks around the outside of the lighthouse, and spends the rest of his time pacing around his private quarters inside. 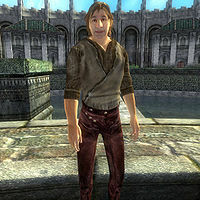 Velan wears lower-class clothing consisting of laced leather pants, a coarse linen shirt and sack cloth sandals, and carries an iron dagger and a few gold coins. The first time you greet Velan, he introduces himself with: "I'm the lighthouse keeper, Velan Andus." If you ask about his job, he doesn't seem very sure that he's doing anything useful: "The lighthouse is mostly for show. You'd have to be an idiot to try to navigate here by night." Esta página foi modificada pela última vez à(s) 05h48min de 14 de julho de 2013.